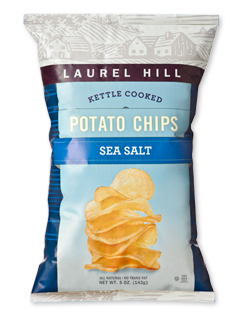 Laurel Hill's Sea Salt Chips had less of a hard, firm crunch like some Kettle Cooked Chips and more of a crispy light crunch. Those tested were not smashy pulpy, like regular Chips can be, but they did crumble under minimal pressure. These Chips were light and airy. They looked less oily and greasy than most Kettle Cooked Chips. There were small oil bubbles and a fairly rough texture. The edges of some had potato skin on. There were lots of odd shaped Chips, which is always a reward for Kettle Cooking. There was not much seasoning visible. It seems somewhat strange that a Chip just containing oil, potato and salt should have more sugar and saturated fat than Laurel Hill's own Barbeque variety, but there you go. Whatever they did, they made a mild, but tasty plain Chip. For in essence that is what it is, a regular, plain Chip, that invariably needs the help of an all singing all dancing sandwich to give it purpose. As you may have guessed, even when they are pretty good, like these, we are not fans of mildly potato flavored Chips here at Chips and Crisps!